This embosser is so simple to use, you'll actually have fun with it. 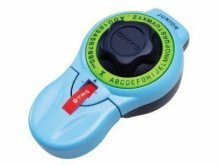 Just use the "turn and click" mechanism and try your hand at creating attractive embossed labels for almost anything that "calls out" for organisation: like your child's notebooks or toy closet, or your garage workshop, CD cases, even files, binders and folders for important documents. Great for kids' projects, too. "Make your words and numbers stick" on 9mm wide embossing tape that's pre-loaded for your convenience. "Turn and click" is ergonomically designed for comfortable use by adults and children . Front exit tape "shows as it goes"